Commander Grant Zilko joined the Royal Australian Navy in March 1983 and conducted initial Officer training at the Royal Australian Naval College, HMAS Creswell and in HMA Ships Stuart and Perth. On promotion to Acting Sub Lieutenant in 1985 he was posted to HMAS Warrnambool for bridge training, and later that year to HMAS Derwent for a Major Fleet endorsement to his Bridge Watchkeeping Certificate. As a Sub Lieutenant he served in Derwent as an Officer of the Watch and as the ship’s Diving/Demolitions Officer. On completion of the Intermediate Navigation course in 1988, he was posted as Navigating Officer of HMAS Geraldton, which at the time was homeported at Fleet Base West HMAS Stirling. He was promoted to Lieutenant in January 1989 and between 1990 and 1993 conducted postings to HMA Ships Curlew, Parramatta and Swan as Navigating Officer and instructor at the Bridge Simulator HMAS Watson. 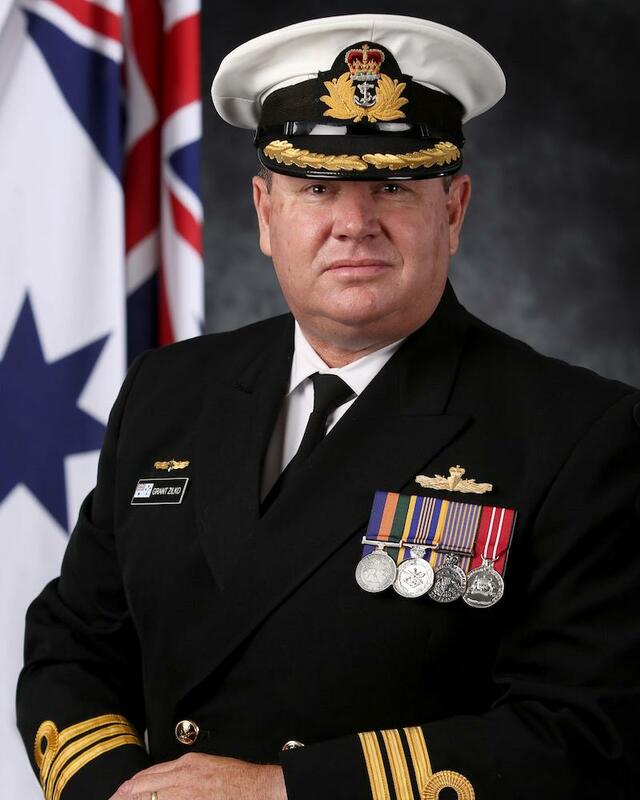 He successfully completed the Principle Warfare Officer (PWO) course in 1993 specialising in Gunnery and, in 1994 was posted as Gunnery Officer and Operations Officer of HMAS Sydney. In 1995 he transferred to the Royal Australian Navy Reserve (RANR) and joined the NSW Police Force as a General Duties Police Officer. He later specialised as a Highway Patrol Officer performing his duties in the Sydney inner west area and later in the Blue Mountains NSW. Whilst with the NSW Police, he remained an active member of the RANR and conducted naval service, including two periods of Continuous Full Time Service at Watson as a PWO Instructor and later as the Operations Officer HMAS Tobruk. In 2006 he transferred from the RANR to the Permanent Navy and was posted to Watson as the Officer in Charge Combat Systems Faculty. In this position, he was responsible for the management of the training facility that provided all training for Combat Systems Operators in the RAN. He was promoted to Lieutenant Commander in March 2007 and assumed Command of ASSAIL SIX (HMA Ships Pirie and Ararat) in December that year where he was heavily involved in operations in support of Border Protection Command predominantly against illegal foreign fishing and unauthorized maritime arrivals to the north of Australia. On completion of his command, he was selected as Operations Officer to Commander Border Protection Commander, commencing that role in January 2010 where his knowledge and experience gained from his command was instrumental in shaping ongoing operations within Border Protection Command. In 2011 he attended the Australian Command Staff Course at the Australian Defence College and was subsequently posted to Military Strategic Commitments before being promoted to Commander in August 2013 and posted to Maritime Operations as the Deputy Director Maritime Operations. In 2015 Commander Zilko was posted to Navy People Career Management Agency where he conducted the role of Deputy Director - Sailors Career Management and later, Deputy Director - Commanders Career Manager. In November 2016 he was selected for MFU Command and assumed Command of HMAS Success on 21 November 2016.